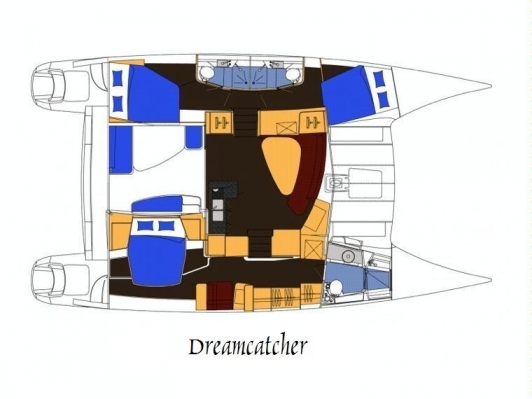 All cabins have been luxuriously appointed in wood and leather with ample storage cupboards. The beds are at knee level with walk around access in the master cabin and ensuite bath rooms with showers, wash hand basin, and toilets. Queen size bed & sheets, settee / makeup table, faux marble clad bathroom, with bowl style sink, wardrobe, panoramic view over the anchorage to starboard and rear view porthole window. Floor plan showing master cabin and two guest suites. Hardwood flooring or dark simulated veneer flooring throughout with oriental carpeting. Modern and state of the art sailing. All lines routed to cockpit/bridge area. A large variety or water sports and water toys are available on-board.